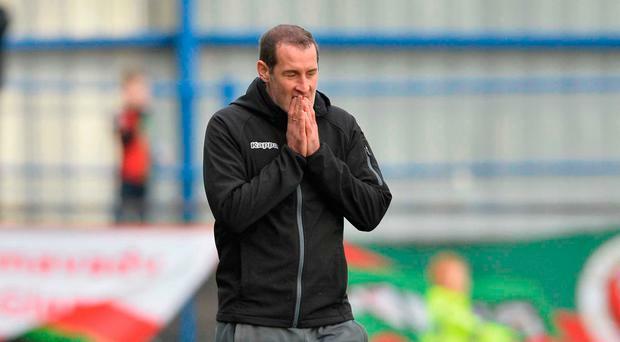 Glentoran boss Gary Haveron says his team must build on last week's performance at Seaview. Although they were edged out by title-chasing Crusaders, the east Belfast boys produced a display of guts, passion and determination - characteristics that have been in short supply of late. The Glens are still clinging onto sixth place in the Danske Bank Premiership table, although Ballymena United are now breathing down their necks. Haveron insists it's crucial his team pick up three points against strugglers Ballinamallard United at The Oval. "We were unfortunate to come away from Crusaders with nothing," he said. "I would rate them as the best team in the league, but we matched them for fight and aggression. "Had we been a little bit more careful in front of goal, we probably would have come away with all three points. Once we get our strongest side on the park, we are a match for any team. "We had Marcus Kane, Calum Birney and Nathan Kerr back in the side and they make a massive difference. We have lost some big players lately - John McGuigan is out long term, but we've also had to do without the likes of Dylan Davidson, Kerr, Birney, Tiernan McNicholl and Ross Redman. Any team would suffer after losing so many players. "When we get our strongest team on the park, I'll put them up against any team in the Irish League. I wouldn't fear anyone. It's a young group of players, a lot of them in their early 20s - Robbie McDaid, Eoghan McCawl, Corey McMullan, Jonathan Smith and Nathan Kerr. They could be the cornerstone of the Glentoran team for a decade." On the plus side, striker Curtis Allen and midfielder James Knowles return to the squad. "It won't be easy against a Ballinamallard side battling for their lives, but we not only need to win, we need a convincing performance to follow our display at Seaview," added Haveron. "We need to be producing that sort of display every week, regardless of who we are playing."